New Earth Micro Farm is the vision of two old souls who have a passion to discover innovation and share knowledge and ideas. We are James LeValley and Cathy LeValley, and our journey as a micro farm has reflected our own personal growth to develop a niche for healthy eating, local food production & restorative agriculture. We are a grower and distributor of fresh organically grown microgreens and shoots, lettuce & salad greens, and petite vegetables. Our fresh produce goes from our farm directly to the consumer at farm markets throughout Michigan or through direct sales to local restaurants or farm market stores. We are driven by a passion to be innovative. At our farm, the wheel never stop turning. In 2017 we added a line of homemade take home food to our product line with snack and party dips, pickled beets and zucchini pickles, and other deli type foods. For the 2018 market season we introduced our new Good Carb food brand for healthy snacks. We are currently exploring more gluten-free and grain-free snack options which can be purchased online. The messages about the changes that are necessary to create a sustainable world model are delivered to us daily in the social media, network news, and through documentary films. We recognize that change is a slow progression of awareness and altered thinking. The process begins with each individual simply being who they are and demonstrating their lifestyle. Through the demonstration and witness of these habits, small seeds are planted and then others begin to duplicate the process or idea and change happens. No mass protests seeking dramatic media coverage is necessary. Whether we realize it or not, change is always silently happening. Our mission is to participate in creating a new Earth attitude where restorative organic growing practices are the desirable choice for farming. The current practice of poisoning and polluting precious natural resources creates unbalance within the eco-system and endangers the living creatures depending on these resources. We believe that it is more important now than ever before in history that consumers know what is in their food and what processes are used to grow and market the end product. When consumers desire a relationship of trust with food producers, this provides an opportunity to develop inter-connected community relationships that supports locally grown food and a regenerative model for food production. Our fresh cut leaf lettuce and lettuce heads go from our farm to the market consumer within 24 hours after harvest. Our raised garden beds are enhanced with our own blend of compost and organic fertilizer and our growing methods are always pesticide-free. Our fresh cut microgreens are produced using organic growing methods and non genetically modified seeds (Non-GMO). 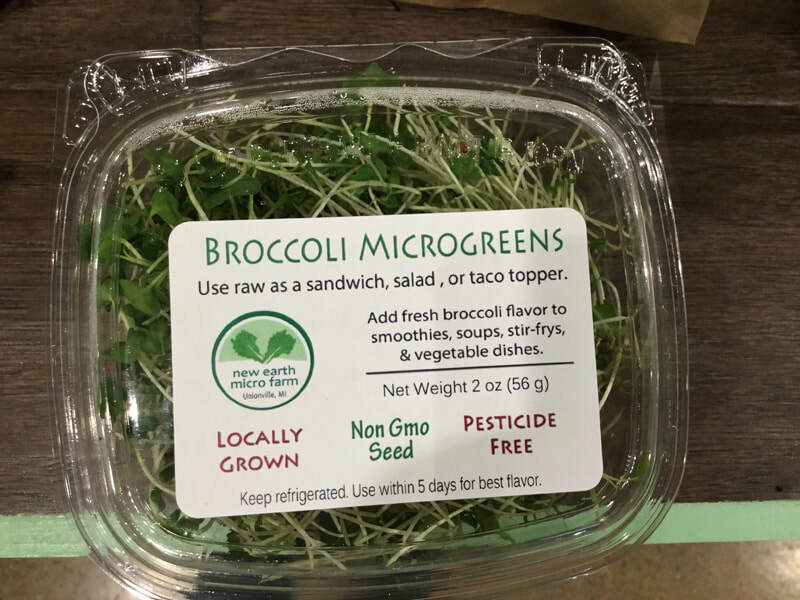 Pesticides are never applied to our produce and microgreen products. We create our own organic fertilizers and compost to enhance our leafy green garden beds. Depending on the variety of microgreens, they are either grown in potting soil or a compostable natural fiber pad. No part of our growing process is considered waste. After a microgreen harvest, our egg laying hens benefit from the remaining stems and seeds and work the soil back into their grazing pasture. A blend of bold taste and colorful stems gives this microgreen blend a powerful punch of flavor and visual variety. This blend contains a radish mix, red cabbage, kale, and kohlrabi offer stems with shades of pink and purple. Each growing season we grow a variety of leafy greens and specialty vegetables which allows our customers to enjoy unique varieties of fresh food. Tri Color Baby Beets - red, white and golden. Leaf Broccoli - use just like kale raw or cooked. Some examples of what we grew for the 2018 growing season. Our egg laying hens include Buff Orpington, Rhode Island Reds, and Ameraucana chickens. Together they produce a colorful carton of eggs with beige, brown and green eggshell colors. Hens gathering for their morning feed in the pasture. Happy chickens are easy to manage. Our hens receive first class treatment. We have a second division of our farm that operates under the brand name Good Carb Foods. Homemade snacks and deli side dishes. Learn more about the Good Carb products we offer.